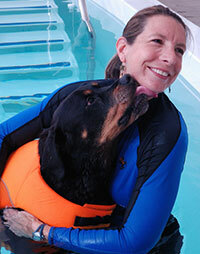 Dr. Evelyn Orenbuch leads the veterinary staff at GA Veterinary Rehabilitation, Fitness & Pain Management. Dr. Orenbuch is a Diplomate of the American College of Veterinary Sports Medicine and Rehabilitation. As a DACVSMR and a member of the first board of directors and former president of the American Association of Rehabilitation Veterinarians, she is a leader in the field of veterinary rehabilitation medicine. Dr. Orenbuch has helped set the standard for what veterinary rehabilitation medicine should be. Dr. Orenbuch is a member of the American Association of Rehabilitation Veterinarians, the International Veterinary Academy of Pain Management, the American Canine Sports Medicine Association, American Veterinary Medical Association, and the Cobb County Veterinary Medical Association.